Pull up a chair at the Writer’s Coffee House, where 22 published authors share their experience and encouragement with fellow travelers on the writer’s journey. By writers, for writers. 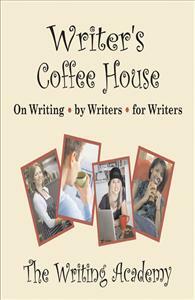 Creative writing is a solitary—sometimes lonely—task, but at the Writer’s Coffee House, you’re among friends. With humor and pathos, 22 published writers share their personal experience, practical advice, and encouragement. From the “Top Ten Ways to Make Your Writing Life Sizzle” (Patricia Lorenz) to “Earning the Right to Be Read” (Randy Ingermanson), this anthology of prose and poetry will be your companion and guide on the writing journey. Learn why you shouldn’t fear failure, how to survive rejection, how to make more time for writing, how to tame the revision monster, and how to write with vision.